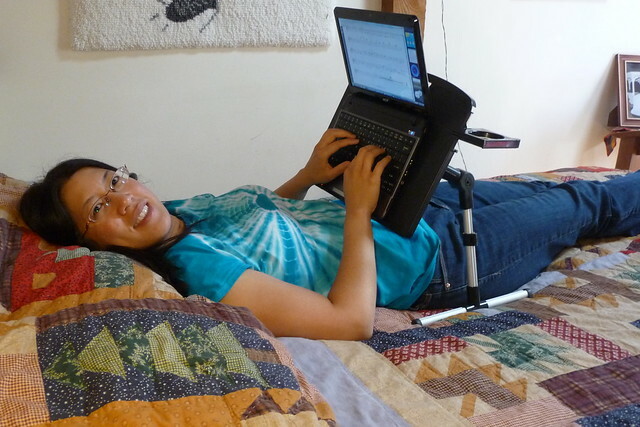 For years, I have been looking for the perfect laptop stand to use while lying down in bed. Before, I would prop up my notebook on my ribs (ouch!) and struggled to use the touchpad. It was never long before I wanted to chuck the laptop. 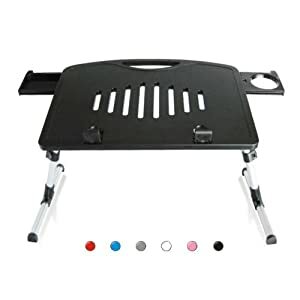 I looked for stands on eBay and Amazon and almost bought a complicated heavy aluminum stand with a zigzag leg configuration. Finally, I found this lightweight plastic laptop stand on Amazon and it is perfect. Do you see how the laptop is not digging into my ribs and my hands are at the perfect height for typing? And I don't need to prop my head up to see the screen. I'm using the stand right now of course. My neck and shoulders are relaxed, so much so that the biggest problem with the stand is that I sometimes fall asleep under it. But seriously, if you're in the market for totally geeking out in bed, check out this stand. I use it with my standard 15" laptop or netbook and it could handle a slightly larger laptop. At this angle, it does get a bit tippy, so it's not for the soft-headed. And the legs are shown at the maximum height, so if you're much bigger than I am, it would dig into your ribs. Since it is small and lightweight, it's really easy for me to move around (especially when half asleep). I even caught Adam using it as a music stand once, it is so versatile! Note: I purchased this ultimate geek stand with a whopping $30 of my own money and blogged about it because it's simply geektastic. I like it. I will use it for my snack or breakfast on my bed or reading a book as well. I did go through purchasing through your Mommy bites. Hope you get some credit. Oh wow. I need this. Like today. Right now. Wow.